Both Mark and Luke inform us that the room was a “large upper room furnished” (Mark 14:15; Luke 22:12). Leon Morris comments on these arrangements. 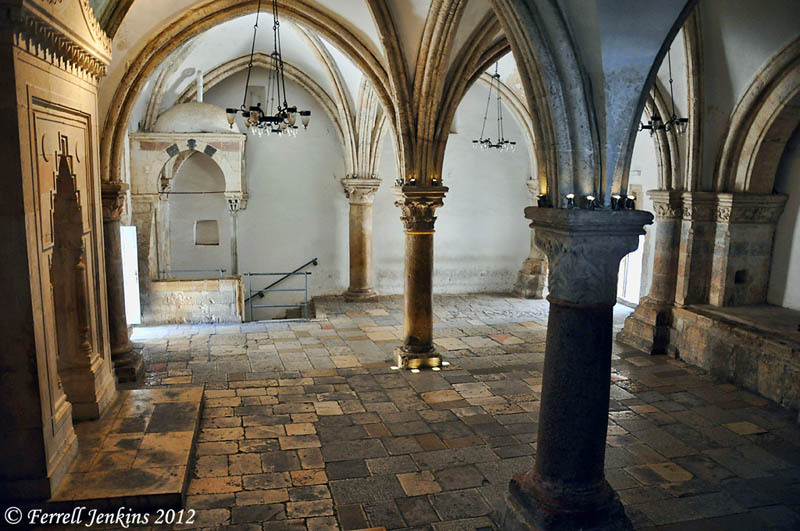 There is in the portion of the Old City of Jerusalem called Mount Zion (which really isn’t) a room known as the Cenacle (Latin) or the Room of the Last Supper. The tradition goes back further, but the building as we see it today dates back to the time of the Franciscans in 1335 A.D. (Murphy-O’Connor, The Holy Land). The traditional room of the Last Supper on Mount Zion. Photo by Ferrell Jenkins. Rather than picturing small round or rectangular standing tables, these words would have called to mind a room with a large U-shaped triclinium dining table with cushions. 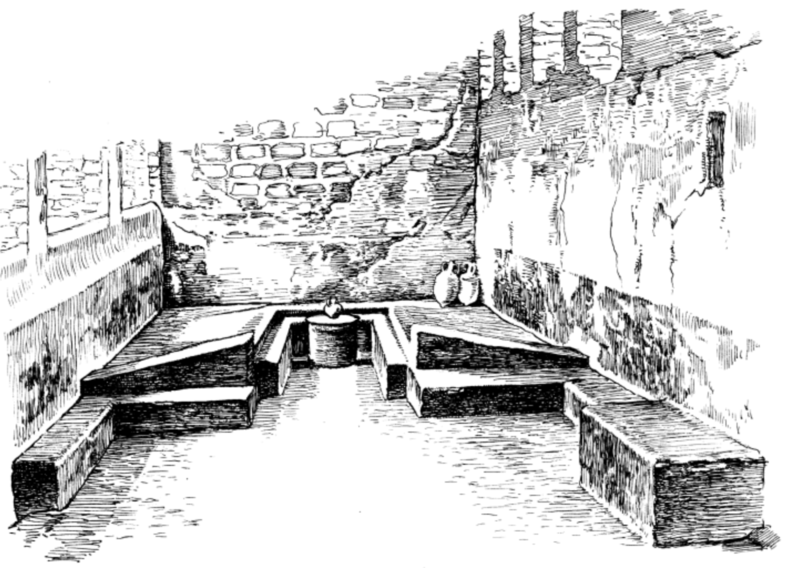 Here is a drawing of a typical Roman triclinium. 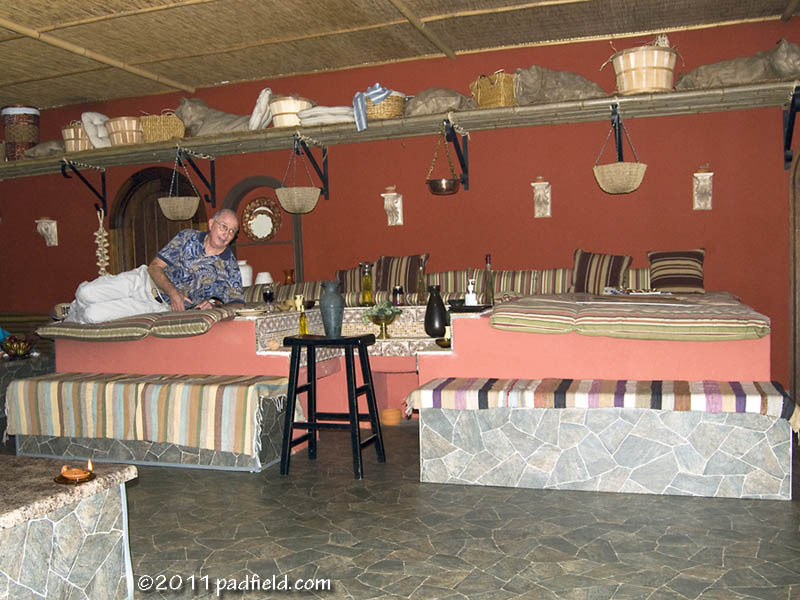 Triclinium. Credit: 1000 Bible Images. And here is a photo of a reconstructed triclinium at the Explorations in Antiquity Center in LaGrange, Georgia [Take the kids with you.]. The photo is courtesy of David Padfield. Triclinium at Explorations in Antiquity Center. Photo by David Padfield. Some of our English versions correctly use the term recline, reclined, or reclining, in the passages relating to eating meals in New Testament times. The KJV and the NKJV use “sat down” or similar terminology. Knowing that the concept of reclining is not understood by modern readers, some translations use a dynamic equivalent such as “took his place at the table” (CEB; NET, with a note of explanation). Remember what you have learned here the next time you come across one of these references in your reading of the New Testament. For a summary of the last week of the ministry of Jesus prior to the crucifixion, see here. This entry was posted in Archaeology, Bible Lands, Bible Study, Culture, Israel, New Testament, Photography, Travel and tagged Last Supper, Ministry of Jesus, Passover. Bookmark the permalink. Balage, thanks for your thoughtful comment and the link to your nice illustration. Very few tricliniums have been found. I do not think Jesus would have been at a place where stone cut seating would have been available. However, this was a prepared place that He had arranged with the owner. It was a large furnished upper room. I can imagine Jesus eating as you suggest in a home like that of Mary, Martha, and Lazarus (Luke 10:38-42). The setting of the Last Supper indicates something different: (1) the large furnished room; (2) the washing of the disciples feet makes perfect sense with the disciples reclining with feet away from the table (John 11:3-12); (3) The disciple Jesus loved was reclining on Jesus bosom (John 13:23); (4) Peter did not hear what Jesus said. He asked the disciple next to Jesus what Jesus had said (John 13:24). The drawing by J. Robert Teringo in The Land & People Jesus Knew (Bethany House Publishers, 1985; page 53) reflects my understanding.